Harnessing Gamification and Mobile, Social, Video and Content Learning Strategies To Increase Workforce Engagement In Enterprise E-Learning Programs. The Only Congress Focused On Integrating Next-Generation e-Learning Strategies Into Fortune 500 Learning Programs. June 22-23, 2015 - Chicago, Illinois. Have you Registered? To fully leverage the benefits of innovative e-learning tools, techniques and technologies, learning and development strategists need to benchmark the functionality, practicality and costs of mobile, social, gamification, video and content solutions. This will enable them to realign their strategic objectives with the ever-evolving learning environment to increase workforce engagement and drive business performance. 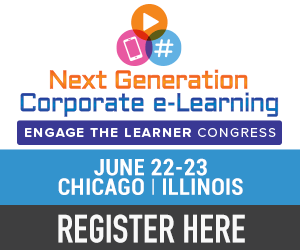 Taking place in Chicago, the Next Generation Corporate e-Learning "Engage The Learner" Congress will deliver over 20 corporate case studies from learning and development strategists on integrating the latest e-learning technologies to measurably improve learning and development budget ROI. Speakers will unveil how to apply gamification strategies and mobile learning tools to increase millennial and multi-generational workforce engagement in enterprise e-learning programs and maximize ROI. They will also share valuable insights on how to develop a comprehensive social learning strategy and optimize on-demand learning, live remote learning and online performance support formass-scale enterprise e-learning programs. Providing real-life case studies on how Fortune 500 companies have implemented gamification strategies into their e-learning programs in ways that resulted in a tangible ROI. Explaining how to cost-effectively implement a mobile learning strategy to increase interactivity and multi-generational workforce engagement in enterprise e-learning programs. Examining strategies for tailoring enterprise e-learning programs to maximally harness the increased functionality that tablets offer and deliver a more dynamic and personal experience to your workforce. Optimizing on-demand, performance support and live remote learning for mass-scale enterprise e-learning programs. Evaluating cutting-edge e-learning technologies such as cloning tools, cloud-base platforms and advanced data analytics to determine which will have the biggest impact on improving ROI. Who Should Attend At The Next Generation Corporate e-Learning "Engage The Learner” Congress?